It seems like just the other day when I sat up on the kitchen counter at my Grandma Lee's house, as proud as I could be that she was letting me whip the mashed potatoes with the hand-held electric mixer. She would always cook the same meal when she knew I'd be coming...fried chicken legs, homemade mashed potatoes, and creamed corn because it was my favorite. She did it out of pure love for me, and I could taste it! 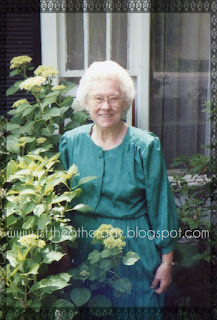 My most vivid childhood memories took place in her tiny white house with the hydrangea bushes in front. It was a little house that held a giant of a woman, that's for sure! She was giant not in her stature, but in her character and heart - - in the things that matter most. I'll never understand how Grandma did it, but she would prepare gigantic meals in her small galley kitchen. She would cook a few different meats and enough veggies to feed an army! Grandma would always have each grandchild's favorite food placed right near where she knew they would sit. And just as you were sure you had eaten way too much, she'd say, "Now, who's ready for dessert?!" We'd all leave the table feeling like we were ready to pop! Ah, mealtimes were the best at Grandma's house! She slaved for hours in her kitchen, but I never once heard her complain. On cold nights when I stayed over at G-ma's (as we called her sometimes), she would go in the bedroom and turn on the electric blanket so that it would be toasty warm when we were ready to hop in the bed. I loved that so much! My Granddaddy Lee had gone to be with Jesus when I was only four years old, but even before he passed, he was kicked out of his own bed when I came to stay. I remember those sweet nights in G-ma's bed because she would talk for as long as I wanted to talk. "Aren't you sleepy?" she would ask. "No, not yet"...and I'd keep on talking and she would, too. I could ask Grandma about anything, or tell her about anything, and she never once made me feel silly. She would listen all night and spill out all of her wisdom, and in turn, I grew in wisdom as well. At some point, if the weather was even remotely comfortable, whoever was at Grandma's house would end up on her back porch. 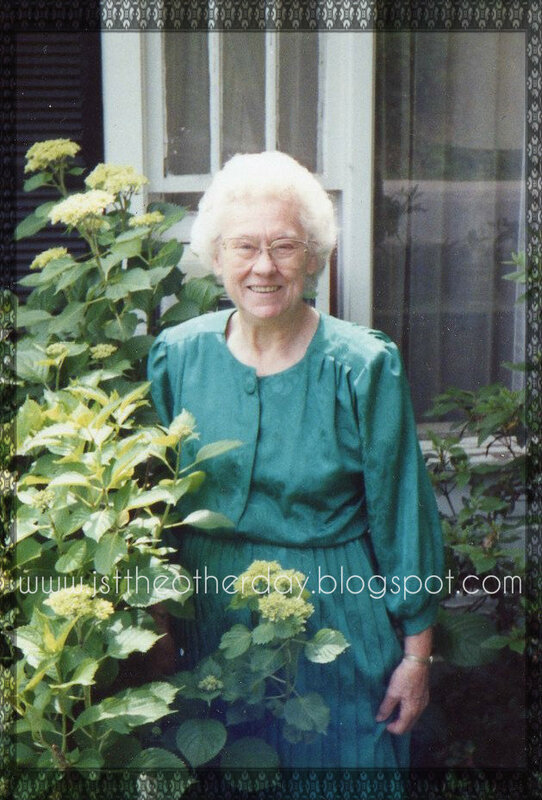 I can still hear her wooden screen door creaking and slamming behind us as we would walk outside. Everyone would pull out a folding chair (the metal frame kind with the webbing on it) and soon start jibber-jabberin' about all the happenings and goings on of our small southern town. Every once in a while there might be a lull in the conversation, especially when the church bells started ringing out a hymn. We'd listen, maybe even hum along a bit, and then we would go right back to talkin'. My goodness, I would give just about anything to get to sit out on that back porch with my Grandma Lee just one more time! Oh, the stories we would tell and the laughs we would have. Whenever we used to talk about my Granddaddy, Grandma would always get teary-eyed and she would stare off a little, partly reminiscing, partly trying to keep her composure. Then, she would always, always say, "You know, you never get over missin' somebody." Truth indeed. Eight years have passed since my sweet grandmother went to be with the Lord, and I still miss her to pieces. I often wonder what she would think of my three little girls, and then I wonder what they would think of her. I have a feeling they would be mutually fond of each another! Looking back, I know G-ma taught me many things, but I think the few characteristics that stick out the most are: love of God, self-sacrifice, unconditional love, humility, family pride, the art of conversation, and the power of togetherness. My grandmother was never rushed and never in a hurry. She would let me plunder in her purse all during church if I wanted. She would grab a jar, take me outside, and let me chase "lightning bugs" until the sun went down. She would take me on long walks near her house. She spent hours with me, all because of love. those moments become our legacy!